Sunrun, the largest residential solar, storage, and energy services provider in the United States, published its second annual Impact Report on Tuesday, revealing that the cumulative impact of its solar systems has prevented almost four million metric tons of carbon dioxide emissions, the equivalent of eliminating over 9 billion passenger-vehicle miles. One of the world's leading residential solar companies, Sunrun, posted its third-quarter earnings on Wednesday to mixed reception, reporting that it installed 100 megawatts (MW) worth of new solar installations over the quarter, but also posting a net loss which surprised investors and analysts. US residential solar company Sunrun confirmed itself as the country's leading solar installer in the second quarter by installing a total of 91 megawatts (MW) worth of new capacity, it's best ever quarter, despite also reporting earnings-per-share well under expectations. Sunrun, the leading residential solar, storage, and energy services company in the US, has announced it is now offering its Brightbox solar-as-a-service and home battery combination to households in storm-ravaged Puerto Rico. 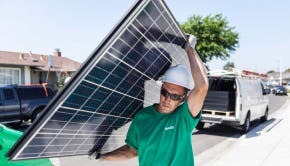 An exclusive Reuters report published last week dealt an unfortunate blow to the US solar industry, revealing that EV giant Tesla's move to cut 9% of its workforce will subsequently downsize subsidiary SolarCity, the company's residential solar business that it acquired in November 2016, resulting in the closing of approximately a dozen installation facilities and ending a retail partnership with Home Depot. What Changed In The Solar Energy Industry In May? Sunrun, the United States' largest residential solar, storage, and energy services company, has announced this week it is expanding its offerings to Floridians with its solar-as-a-service and Brightbox home battery solutions, in an attempt to pre-empt hurricane season. The leading US residential solar installer Sunrun earlier this month announced its first-quarter earnings which, despite revealing the company's deployments were down 7% for the quarter, nevertheless reported that revenue was up by an impressive 36%. Houston-based solar power company Sunnova has this week expanded its offerings to bring it into the solar-plus-storage market alongside its bigger-name competition Tesla and Sunrun with the introduction of its Sunnova SunSafe solar and home battery storage service.